Prominent & Leading Manufacturer from Faridabad, we offer colour coated roofing fiber sheet, fiber profile roofing sheet 5 nali, fiber sheet 6 nali, frp sheet 12 nali, fibre sheets and fibreglass roof sheets. We are involved in delivering a wide series of Colour Coated Roofing Fiber Sheet. Our presented range is available in diverse specifications that meet on client's demand. Owing to the affluent knowledge, we are capable to provide Daylight Profile Roofing Sheet. Moreover, the presented series of products is properly checked on varied industry standards to make sure the longer life. We are a well-known name, involved in providing an extensive series of Fiber Sheet. Our product is extremely employed by customers owing to their sturdy nature. 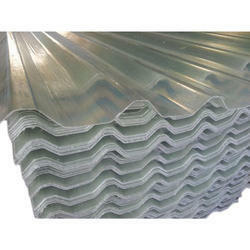 We are well-known firm of FRP Sheet. In addition, quality experts also check the quality of this product on varied industry standards. Besides, we offer this product at nominal costs. Design Plain, Corrugated, Profiled, Decking, Tray & Tiled. Size(inch X inch) Any, as per customer requirement. Our Fibre Sheets are manufactured through both the Hand Lay Up as well as Continuous Forming (mechanized) Process. Superior Grade (U.V. Stabilized) Resin (Polyester / Vinylester / Epoxy) is reinforced with Glass Fibre Matrix to obtain excellent physical, mechanical and chemical properties. Glass imparts strength to the Sheets whereas the Resin binds the Fibre and determines the Sheet’s overall resistance to environmental degradation & wear & tear. Fibre Sheets can be colored (opaque) or largely transparent. These can be manufactured in several Corrugations & Profiles. Transparent Sheets are used for natural day lighting in industrial sheds, warehouses, commercial buildings and infrastructure facilities. These Sheets help save precious power meant for artificial lighting purpose. Our Fibre Roofing Sheets are strong, impact resistant, light & weather proof. Fibre Sheets (especially the colored-opaque ones) can also be made anti-corrosive and fire resistant, if need be. 5. Commercial establishment such as multiplexes, shopping malls, restaurants, schools, clubs, amusements & water parks, etc. 6. Infrastructure facilities such as foot over bridges, walk ways, parking lots, metro, railways, airports, ship dock yards, ports etc. Packaging Details: PP Packaging with bubble sheet inside. Our Fibreglass Roof Sheets are manufactured through both the Hand Lay Up as well as the Continuous Forming (mechanized) Process. Superior Grade (U.V. Stabilized) Resin (Polyester / Vinylester / Epoxy) is reinforced with Glass Fibre Matrix to obtain excellent physical, mechanical and chemical properties. Glass imparts strength to the Sheets whereas the Resin binds the Fibre and determines the Sheet’s overall resistance to environmental degradation & wear & tear. 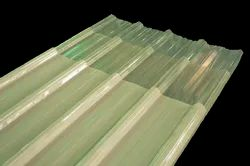 Fibreglass Roof Sheets can be colored (opaque) or largely transparent. These can be manufactured in several Corrugations & Profiles. Our Fibreglass Roof Sheets are strong, impact resistant, light & weather proof. 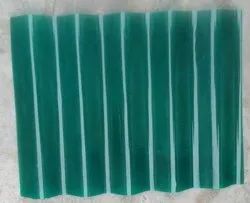 Fiberglass Roof Sheets (especially the colored-opaque ones) can also be made anti-corrosive and fire resistant, if need be. Design Any, as per customer requirement. Density Depends on the thickness. Pattern Any, as per customer requirement. Our F.R.P. Sheets are manufactured through both the Hand Lay Up as well as Continuous Forming (mechanized) Process. 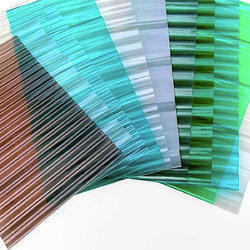 Fiber Sheets can be colored (opaque) or largely transparent. These can be manufactured in several Corrugations & Profiles. Transparent Sheets are used for natural day lighting in industrial sheds, warehouses, commercial buildings and infrastructure facilities. These Sheets help save precious power meant for artificial lighting purpose. Our F.R.P. Sheets are strong, impact resistant, light & weather proof. 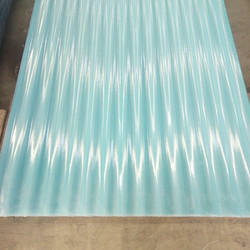 Fiberglass Sheets (especially the colored-opaque ones) can also be made anti-corrosive and fire resistant, if need be. Size- Any, as per customer requirement. Design Pattern- Any, as per customer requirement. Thickness Any, as per customer requirement. Our F.R.P. Roofing Sheets are manufactured through both the Hand Lay Up as well as Continuous Forming (mechanized) Process. Superior Grade (U.V. Stabilized) Resin (Polyester / Vinylester / Epoxy) is reinforced with Glass Fibre Matrix to obtain excellent physical, mechanical and chemical properties. Glass imparts strength to the Sheets whereas the Resin binds the Fibre and determines the Sheet’s overall resistance to environmental degradation & wear & tear. F.R.P. 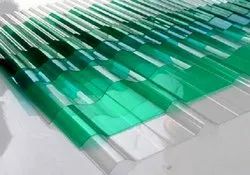 Roofing Sheets can be colored (opaque) or largely transparent. These can be manufactured in several Corrugations & Profiles. Our F.R.P. Roofing Sheets are strong, impact resistant, light & weather proof. 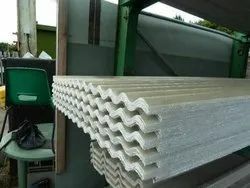 Our Fibreglass Sheets are manufactured through both the Hand Lay Up as well as Continuous Forming (mechanized) Process. Superior Grade (U.V. Stabilized) Resin (Polyester / Vinylester / Epoxy) is reinforced with Glass Fibre Matrix to obtain excellent physical, mechanical and chemical properties. Glass imparts strength to the Sheets whereas the Resin binds the Fibre and determines the Sheet’s overall resistance to environmental degradation & wear & tear. 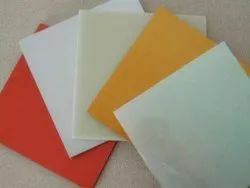 Fibreglass Sheets can be colored (opaque) or largely transparent. These can be manufactured in several Corrugations & Profiles. Looking for Roofing Fiber Sheets ?